TNF CRICKET has aligned itself with some of the best manufacturers in the world of cricket – bats, protective equipment, gear bags and most recently cricket apparel. Our cricket bats are hand made in India and made of English Willow, with a selection of junior cricket bats made of Kashmir Willow. Our cricket bat manufacturer has been in operation for almost 50 years, giving you a lot of comfort and confidence in the cricket bat TNF creates. All bats are handcrafted individually, enabling each cricket bat to have its own personality, which is what a professional cricketer demands of their product supplier. Our protective equipment is produced using the highest quality materials. Extensive research & testing has taken place in order to establish the feel, the look and most importantly making sure the protection is optimal. The products are always made to enable cricketers at any level to be more than comfortable when they stride to the crease. TNF CRICKET launched its club apparel and merchandise range in 2013. The brand has invested in it’s very own sizing patterns to avoid concerns that many cricketer’s face. TNF CRICKET has worked extremely close with experienced fabric manufacturers in Melbourne and across the World to ensure the best quality product is being made at all times. The brand is proud to boast that all its sublimation cricket apparel for off field is sourced and decorated here in Melbourne. 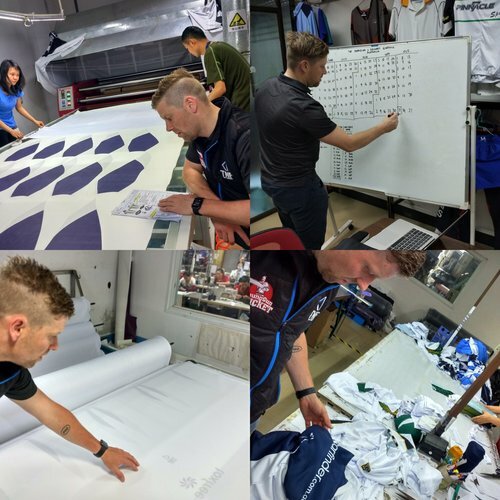 The sublimation apparel is all made off shore in Zhong Shan China where we have struck an outstanding relationship with the Australian/Chinese production factory that specialise in these products. Merchandise for cricket clubs is readily available and with quick service which is sure to impress clubs. ALL sublimation apparel products take approximately 28-35 days once the colours, names, numbers, sponsors and art work is signed off on by the client. WE ALWAYS endeavour to have our products made as efficiently and quickly as possible without jeopardising the quality of the products. We are confident that the easy processes will please all and cater for men, women and children. Our new online store process has increased the capabilities for volunteers at club level to be less stressed with collating so many orders from players and parents. The process of setting up your own club store is fast and easy with the help of our team here at TNF CRICKET. Ask us today to get your club online asap.